Vegetable Gardening & Urban Farming: Heirloom Tomatoes & Other Vegetables, Garden Design, Container Gardening, Chickens, Bees. Podcasts - Audio version of PlanterTomato posts can be found at the Apple iTunes Store or visit the PlanterTomato Podcast web site and subscribe directly. Facebook- Subscribers are also encouraged to join the PlanterTomato Facebook Group. PlanterTomato Named One of the Top 10 Garden Blogs by MyLifeScoop.com. PlatnerTomato Voted One of the Most Popular gardening blog on the DigInDirt gardening blog directory. Check out this article on how how the design of the BriteTap chicken waterer bucks the trend -- it's Chicken waterer designed to last. Win A BriteTap Chicken Waterer in our Easter Egg Hunt contest. The egg hunt works like “I Spy” or “Where’s Waldo” if you are familiar with those games. You need to located 5 objects hidden among other objects in a photo. Find the five, and your entered into the drawing. 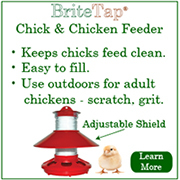 Two people will win a BriteTap chicken waterer (retail value $29.95). Want to support new, innovative products designed for people who keep chickens? Then please cast a vote for us in the FedEx Small Business Grant program. The FedEx program will award a $25,000 grant to a qualifying small business with fans willing to cast a vote for them. ChickenWaterer.com is the maker of the innovative BriteTap waterer that shields water from dirt and poop so chickens get cleaner water and owners don't need to clean out filthy water pans. If we win, we'll invest the funds in developing new products for people who produce their own food at home. It only takes a click to cast your vote, so please vote for us today! You can vote one time each day, so vote frequently. OK, I hear you saying, "what is a wheat berry?" It's just the term for wheat that has been separated from the hull but is otherwise unprocessed. In other words, it's whole wheat. In my posting on July 7, I showed you how to thresh and winnow the grain to yield these wheat berries. In this posting, I'll show you how to grind the wheat and make it into pasta. Once you have your wheat berries, you need to grind it into flour. There are a number of different devices on the market that allow you to do this ranging from hand cranked grinders to dedicated grain mills. If you want to know more about the subject, check out my previous posting Flint Corn & Grain Mills Used to Grind Corn, Wheat and Other Grains. I have a KitchenAid mixer and the company makes a variety of attachments including a grain grinder and a pasta roller/cutter. That's what I used to grind my grain, but you can use whatever grinder fits your budget. While the KitchenAid is a good appliance, trying to grind from wheat berries to flour in one pass is not a good idea. It puts too much stress on the motor and I've read plenty of posts about people who destroyed their mixer. The best approach is to grind the grin in three or four passes. Start by doing a coarse grind and then progressively grind the grain to a fine powder. On the KitchenAid grinder attachment, you do this by rotating the dial on the front of the grinder. I did four grinds and ground a pound of flour in about 10 minutes. One other tip...put small amounts of grain into the hopper at any given time or you'll clog your grain mill. Once the flour is ground, use 3 large eggs and 2 cups of flour for as much pasta as you would like to make. Beat the eggs and incorporate them into the flour. Then lightly flour a cutting board and knead the dough for about 5 minutes. You want to keep the flour from sticking to the board so add some flour as needed, but try to use as little as possible as this can lead to tough pasta.Once the flour is kneeded, set it aside in a bowl for 15 minutes. You're now ready to make the pasta. I used an attachment on my KitchenAid mixer to flatten the pasta. I set the roller attachment for the widest setting and ran the pasta throught the rollers. I then turned the adjustment knob to a narrower setting and ran the dough through again. There are a number of settings that go from very wide to very thin. Choose a setting that corresponds to a pasta thickness you like. You would use the same proceedure if you have a hand-cranked pasta maker. If you are going all manual on this, roll out the pasta to your desired thickenss with a rolling pin. I then changed the attachment on my KitchenAid, replacing the rolling attachment with the pasta cutter attachment. I then ran the pasta through this and let the pasta "noodles" fall onto a floured cutting board. If you intend to cook the pasta immediately, you don't need to worry about the noodles sticking together. They can be seperated with a spoon when you drop them into boiling water. However, if you plan to use the pasta at a later date, you might want to place the noodles on a pasta drying rack so they stay seperated. If you don't have a KitchenAid pasta maker attachement or a manual pasta machine, you can lay the rolled pasta onto a cutting board and cut the noodles with a knife. The pasta wont' be as uniform if you do this, but don't worry; it will taste just as delicious. Fresh noodles cook in just a few minutes. Bring a pot of salted water to the boil. Drop in the noodles. Cook for for 2 or more minutes till done. The cooking time depends on the thickness of the pasta, so just taste it as it cooks and find the right time for your tastes. Serve immediately and dress with pasta sauce, butter and parmesian cheese, pesto, or whatever is your favorite topping. Whole wheat pasta is brown, not white. Don't let the color fool you. Whole wheat pasta is really yummy. Many followers of this blog know that I am a gardener, bee keeper and poultry enthusiast. Over the last few years, I've gotten tired of cleaning out the chicken waterer because the water is exposed to the open air and is frequently contaminated by dirt, debris and droppings. I'd like to introduce you to the BriteTap chicken waterer. 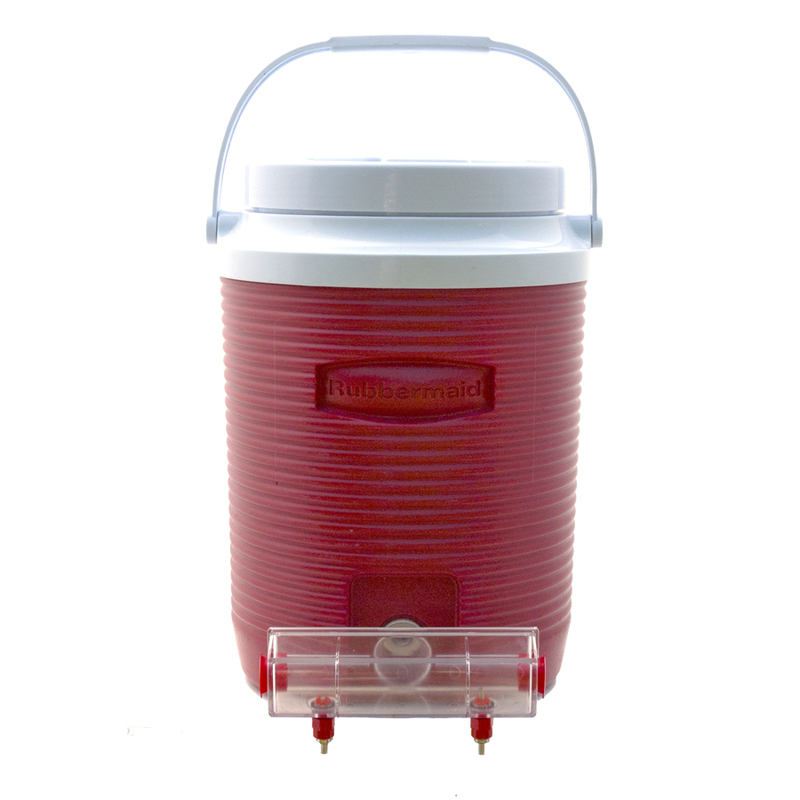 The BriteTap waterer keeps your chickens water clean because it is fully covered and thus shields the water from contamination. Chickens drink from valves on the bottom of the waterer. This is better for chickens and better for owners because you don't have to clear-out the waterer from the nasty stuff that falls into it. I tested this waterer with a group of owners earlier this year and the response was very enthusiastic. If you would like to buy the BriteTap waterer, or the BriteTap paired with a 2-gallon insulated water supply tank (water cooler), visit ChickenWaterer.com. In October of last year, I planted an heirloom wheat variety called Frassinetto. In this posting, I'll let you know the results of this experiment as well as explain how to thresh, winnow and store the grain. To put this in perspective, the 100 square foot plot that I set aside for my wheat would produce only 3.5 pounds of dry grain if I got the same results as those in the University of California's trial. As noted in the table, Frassinetto grows to 55 inches, much taller than modern varieties that reach only 30-40 inches in height. Frassinetto's height is not an advantage, it is easily blown down by the wind and this seems to explain in part why this variety is lower yielding. In the trial, about 40% of the Frassinetto plants tipped over, a condition called "lodging." To try to maximize my yield, I provided support for the wheat plants. I placed stakes in the field every few feet and then ran twine between the stakes at about 18 and 36 inches above the ground. The wheat seeds would grow through this lattice work and it was my hope that they would provide enough support to prevent the wheat from tipping over in the wind. As it turned out, this system did help a good amount of wheat still lodged; I didn't measure this in a rigorous way, but I would guess about 15% lodging versus 40% in the University of California's trial. As mentioned above, if I got the same yield as that achieved in the University of California trial I could expect to harvest about 3.5 pounds of Frassinetto. As it turned out, I harvested 5.2 pounds, 49% better than the trial. But my experience also shows that while adding support improves Frassinetto's yield, the varieity still yields far less grain than modern wheat varieties. In theory, I might have harvested 14-17 pounds of dry grain from the same plot if I had chosen a modern wheat. Wheat should be harvested when the head of the wheat has turned yellow or tan/brown. If you remove some of the seeds and rub them in your hands, the grain will feel hard. The shape of the grain head is also a good indication since it will begins to bend towards the ground as the plant prepares to release the grain seeds. If you want to harvest a bit early or if some of the grain is not quite ready, you can "shock" the grain and allow it to dry for a few weeks in the sun. Once the wheat is dry you need to remove the grain from the grain heads, a process called threshing. Traditionally this was done with a flail. The grain is laid down on a sheet and beaten with this simple wooden implement. There are many variations on how to thresh. I've seen people step on the grain with their shoes, place the grain in a pillow case and thresh by hitting the outside of the pillow case with a rolling pin, and even one gent who created a threshing device from a bucket and a chain. The chain was attached to an electric drill then this was inserted into a bucket that was filled with wheat heads. The spinning chain struck the grain and dislodged the grain from the chaff. I tried the pillow case method and found it very inefficient. So I tried stepping on the grain with a pair of sneakers. The treads in the sneakers did a remarkably good job or stripping away the chaff and was a fine method for small harvests like mine. After threshing, your left with a large pile of wheat seeds mixed with chaff. The chaff is the dry seed casings. To seperate the wheat from the chaff, lay a sheet or tarp on the ground. Set up an electric fan at one end of the tarp and turn it on. Then drop the grain and chaff mixture in front of the fan. The wind created by the fan will carry off the lighter chaff, while the heavier grain will drop right in front of the fan where it will collect on the sheet. You can then scoop up the grain. In practice, I found that running the grain/chaff through this fanning process twice did the trick. To store the grain, place it in a plastic bag or vacuum seal bag and drop it in the freezer. In my next posting, I'll explain how to grind the grain and provide a recipe for whole wheat pasta. This is shaping up to be a good garden year. Earlier this spring, I planted Thomas Laxton and Laxton's Progress peas and we harvested over 20 pounds of sweet, delicious peas. Most were consumed fresh but we were able to put a few pounds away in the freezer for future dinners. If all goes well, we'll grow one more round of peas in the Fall. By the way, both of these English pea varieties are excellent. The Laxton's Progress produce larger pods and are a bit sweeter in my opinion, but you can't go wrong with either. To learn about freezing peas and other veggies, check out my prior posting on Freezing & Using A Vacuum Sealer. We have also harvested and enjoyed the last of the Artichokes. Artichokes are in the thistle family and are very easy to grow. They just need to be waterered and nature takes care of the rest. If you're growing garlic and onions you have either harvested them or are just about to do so. The onions we grew this year are a variety called Red Weathersfield and the garlic is a medium hot hardneck variety called Purple Glazer. Both are excellent and it never seems we have enough of either. For those interested in growing garlic, you should be aware that it is planted in the Fall and harvested the next Spring/Summer. If you would like to add garlic to your garden, plan on buying garlic sets in September. To learn more about growing and harvesting garlic, see my postings on planting garlic, overwintering garlic and onions, and how to harvest and store garlic. In the past, I've grown an Alpine strawberry variety called mignonette. This variety is an intensely perfumed and delicious berry, but the strawberries are only a little bigger than a garden pea...Tasty but too time consuming to harvest for the amount you get, so this year I planted a June bearing variety called Sequoia and an everbearing variety called Quinalt. Both produced well in the first year and fresh picked strawberries from the garden leave supermarket berries in the dust. Our cucumbers have been rolling in for the last several weeks now. In our family, we tend not to eat many cucumbers in salads, so all the varieties we grow are bred for pickling. For long-term storage, pickles should be canned using a pressure canner. However, you can make "quick pickles" that will last in the refrigerator for a few weeks when stored in brine. The brine is made from water, vinegar, sugar, salt and seasonings. The seasonings vary but include things such as bay, dill, mustard seeds, garlic, etc. To quick pickle, you throw all the ingredients into a pot and bring them to a boil. Then you place sliced cucumbers into a jar and pour the brine over it. When the pickles come to room temperature, you place them in the refrigerator. That's all there is to it! If you do an Internet search, you'll find plenty of these recipes. Just choose one that appeals to you. Quick pickling is so fast and easy that you can a bunch of these recipes to find a few favorites. Sadly, we are now approaching the end of our green bean harvest after having harvested them for at least the last three weeks. The variety shown below is Slenderette from Renee's Seeds. This was a new variety for us this year and, when I planted it, I hought they would be particularly tender due to their slender shape. As it turns out, they are not really any more tender than other varieites. Burpee's Tenderpod is the variety to beat. In my next posting, I'll let you know about a variety of Wheat I grew this year called Frassinetto. I harvested it a few weeks ago and have put away the wheat berries which we plan to grind into pasta flour. Earlier this year, I received sample packs of a number of new vegetable varieties from Renee's Seeds. One that I was particularly eager to test was a new type of arugula that is supposed to taste like wasabi. Wasabi is a spicy condiment that is popular in Japanese cuisine. It's what gives sushi it's hot kick and is similar in taste to horseradish. I love the "burn" that wasbi brings to food and was eager to see if this new arugula really tasted like wasabi or was merely a very hot tasting variety. Rejoice wasabi lovers. This variety of arugula really does indeed taste like wasabi and yes, it is VERY spicy. In fact, it is hotter to my taste than Rocket (Roquette) arugula which was our standby variety for years. I ate a salad completely made of wasabi arugula and enjoyed it. However, I think most people people would find this overpowering, so try it as an addition to your salad first and decide whether you like it enough to go wasabi arugula purist. One more thing....Wasabi arugula has a color that is a deeper green than many other varieties of arugula. A plus in my book. If you like wasabi, trust me, you'll absolutely love wasabi arugula. This is now my favorite arugula behind another variety called Runway which is also a Renee's Seed selection. You can find seeds for Wasabi Arugula at Renee's web site and at select garden centers around the country. If you decide to try this, remember that arugula likes cooler conditions, so plant in the late Summer for a Fall harvest.